Mazda's 3 is a cool, good-to-drive alternative to the mainstream norm. Mazda has always had a decent contender in the small family hatchback segment, even if it has gone unnoticed by the masses. That’s not about to happen with the current car, as its stand-out looks are very dramatic in such a conservative class, while its interior is smart and well-equipped, too. In a class that’s defined by conservatism the Mazda3 is very distinctive; it’s a riot of lines and curves, making it a really bold choice among its mainstream rivals like the Ford Focus and Toyota Auris. It’s smart inside too, while the space is also decent. That it drives well only adds to its appeal, while economy and emissions are as competitive as they have to be in this tough class. Fun, engaging to drive and stylish, which is an unusual combination for a mainstream hatch. Mazda talks up its Skyactiv technology a lot, lightening for efficiency, though it’s also refreshingly non-conformist in offering a big 2.2-litre diesel. A 105hp 1.5 diesel has since joined the line-up, offering 99g/km CO2 emissions for a €180 tax bill. The bigger diesel has a noticeable 45hp more, yet only costs an additional €10 a month on tax. 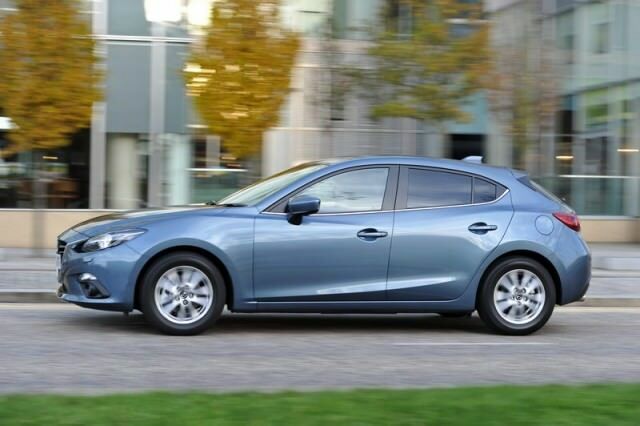 You get style and substance in the Mazda3, its bold lines, nicely finished, good-sized cabin and fine driving dynamics make it a very appealing choice in the family hatchback market. Slightly higher than normal pricing does count against it, but the standard specification is very comprehensive across the entire line-up by way of compensation. The 2.2-litre diesel is quick, yet low emitting, and worth having over the 1.5-litre turbodiesel, while the 1.5-litre petrol offering is not really worth consideration.